A not for profit initiative with mission to promote in Greece antispeciesism, fair trade and Zero Waste Lifestyle. We envision a world in which our activism will no longer have a reason to exist because all non-human animals will be free and will live in their natural environment which will no longer have been raped by humans. 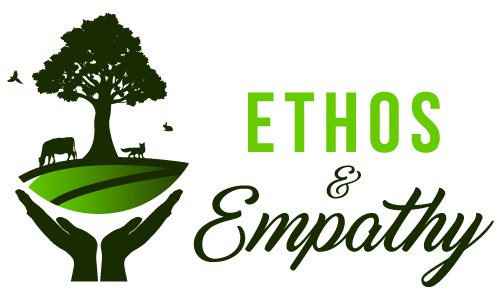 Why Ethos & Empathy? What is the message and what is the vision? The message is for someone to live with ethos and empathy. To act ethically. The vision is a world without discrimination of any kind and a planet without garbage. A world, that is, without speciesism, racism, sexism, homophobia and a world where no one would exploit the weak and neither would make them feel inferior. We dream of a clean planet, no longer affected by the over-population of the human species and all the suffering that this brings. However though, we envision a world in which our activism will no longer have a reason to exist because all non-human animals will be free and will live in their natural environment which will no longer have been raped by humans. Antispeciesism! What is fighting for? Antispeciesism is fighting against speciesism. Speciesism is the descrimination of animals depending their species. By analogy with racism and sexism, this concept refers to the ideology considering that the lives and interests of animals can be overlooked simply because they are of another species. Antispeciesists are fighting for the total animal liberation and it’s a fight for anarchy. They believe that adopting a vegan diet & a vegan lifestyle is a passive way of fighting but they also realize that this life decision is anarchist. They reject in total capitalist -and not only- financial structures but also they reject every kind of power structure and hierarchy. The antispeciesist movement addresses not only issues in regards to animal oppresion but all kind of social injustice and exploitation (racism, sexism, homofobia). So they are fighting against every kind of discrimination and exploitation of all the oppressed, not only of the non-human animals. People from the animal liberation movement have been similarly likened to the “Freedom Fighters” who released prisoners in Nazi Germany. We started last autumn by setting up our website www.ethosandempathy.org/en/ in which we collected all the information that someone who wants to live ethically would need. We collected for example all the books and documentaries in regards to animal rights and the vegan lifestyle. In addition, we created a vegan directory meaning a page where someone can find all vegan / cruelty free services and products that are available in Greece. Most important though, is that we started to publish articles, ours but also many translated ones so a Greek person who doesn’t understand well the English language, can be educated on issues regarding fair trade, ecology and zero waste lifestyle and of course regarding animal rights and animal liberation. Up until now we have conducted 4 actions: The first one was Athens’ participation at the Global Eye Contact Event which is organized in an international level by the Liberators International, the 2nd one was a screening of two documentaries regarding plastic pollution and the huge problem caused by plastic straws, the 3rd one was to create public awareness on the 25th of August (World Day for the end of Speciesism) by giving away some leaflets (printed in recycled paper of course) which explained what speciesism is and the last one was to prepare and share vegan food in compostable packages to homeless people at the center of Athens. In the meantime, some small actions as well have taken place, through which the goal is to inform people about the abuse and exploitation that animals experience in an everyday level because of speciesism (like for example to share leaflets at the antiracist festival and make the people consider the link between antispeciesism and antiracism). The first official animal rights march took place in Greece. Tell us about the necessity of such a move? Marches are necessary in the context of political activism. Most vegans think that by influencing other people to become vegan we will achieve animal liberation. However, while the number of vegans around the world is growing, the number of animals that are bred and killed every year at the altar of their exploitation for nutrition, clothes and science’s development are growing also. Veganism, unfortunately, by going mainstream, has become a victim of capitalism and, instead of aiming for animal liberation; it ultimately aims at shifting our consumer model. Although we recognize this shift, we just think that this is not the solution to the problem but we see it as an anteroom. Those of us who are fighting for animal rights and their recognition, should think about how feminism has risen, how slavery “stopped” (and I put quotation marks because unfortunately even today slaves are sold, for example in Libya) etc. One thing is for sure, not by speaking to the world one by one. The requirement of justice is equivalent with legislative, institutional or social change while the calling to virtue is depoliticised: it asks people to change their individual behavior- words very well expressed by the activists of 269 Libération Animale. We have a lot in our agenda. We want to force the competent operators to charge the plastic bag everywhere and not only at supermarkets and large businesses, and the price that they charge should be increased. We want to criminalize the dumping of garbage, to introduce a meat tax to cover the environmental and health costs – caused by eating meat, and finally to create a new Fair Trade certification, which will be fair for non-human animals also. Of course the main dream is to set up a farm sanctuary where kids from schools and institutions could pay visits in order to see the real behavior of animals like cows and turkeys – animals that up until now we have not been able to see their natural behavior, because we only have them locked in filthy places, where they cannot move. Kids must see how playful cows are. How tender turkeys and chickens can be, how clever and sweet pigs are.